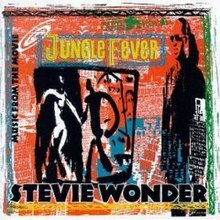 Jungle Fever is the 1991 soundtrack album by American R&B musician Stevie Wonder to Spike Lee's movie Jungle Fever. It was released by Motown Records on May 28, 1991. Jungle Fever received lukewarm reviews from music critics. In a contemporary review for The Village Voice, Robert Christgau cited "Fun Day" and the title track as highlights and referred to Wonder as "a genius even if that's what he's selling". Bill Wyman of Entertainment Weekly felt it lacks memorable hooks and was critical of Wonder's lyrics and style of arrangement, which he said sounds "more and more dated as the years go by". In a positive review, Rolling Stone magazine called Jungle Fever a "welcome return to form" and said that Wonder has not "sounded so freewheeling, confident and engaging" since his 1980 album Hotter Than July. The Chicago Tribune wrote that it is "as direct and consistently tuneful as anything he has done in recent years". In a retrospective review for AllMusic, Stephen Thomas Erlewine cited Jungle Fever as "Wonder's best work in years ... a considerable improvement from his bland late-'80s albums", although he said Wonder can be too sentimental on ballads such as "These Three Words". J. D. Considine wrote in The Rolling Stone Album Guide (2004) that it is "lightweight but likeable". In his 2000 Consumer Guide book, Christgau gave the album a three-star honorable mention, which indicated "an enjoyable effort consumers attuned to its overriding aesthetic or individual vision may well treasure". All songs written by Stevie Wonder, except "Chemical Love", lyrics by Stephanie Andrews. ^ a b c Wyman, Bill (June 21, 1991). "Music from the Movie 'Jungle Fever' Review". Entertainment Weekly. New York (71). Retrieved October 21, 2014. ^ a b Erlewine, Stephen Thomas. "Jungle Fever - Stevie Wonder". AllMusic. Retrieved October 21, 2014. ^ a b Anon. (1991). "Stevie Wonder Music From the Movie `Jungle Fever'". Chicago Tribune (June 13). Retrieved October 21, 2014. ^ a b Christgau, Robert (2000). Christgau's Consumer Guide: Albums of the '90s. Macmillan. pp. xvi, 339. ISBN 0312245602. ^ "Review". Q. London (August). 1991. Retrieved October 21, 2014. ^ a b "Review". Rolling Stone. New York (August 8). 1991. Retrieved October 21, 2014. ^ a b c Considine, J. D. (2004). "Stevie Wonder". In Brackett, Nathan; Hoard, Christian (eds.). The New Rolling Stone Album Guide (4th ed.). Simon & Schuster. pp. 885, 887. ISBN 0-7432-0169-8. ^ Christgau, Robert (1991). "Consumer Guide". The Village Voice (July 30). New York. Retrieved October 21, 2014. This page was last edited on 22 December 2018, at 09:18 (UTC).